Madison Eagles has experienced the kind of comeback that’s rare to come by in women’s wrestling. In October of this year, she became a two-time SHIMMER Champion, a whole four years after her first reign ended at the hands of Cheerleader Melissa in 2011. It wasn’t an easy road to get there. As a two-time SHIMMER Champion, Madison is in rare company – only Cheerleader Melissa’s accomplished the same thing. What sets Madison apart from Melissa, though, is the expanse of time between her reigns. Shortly after she dropped the title in 2011, Madison suffered a near career-threatening injury, which put her out of action until 2013. 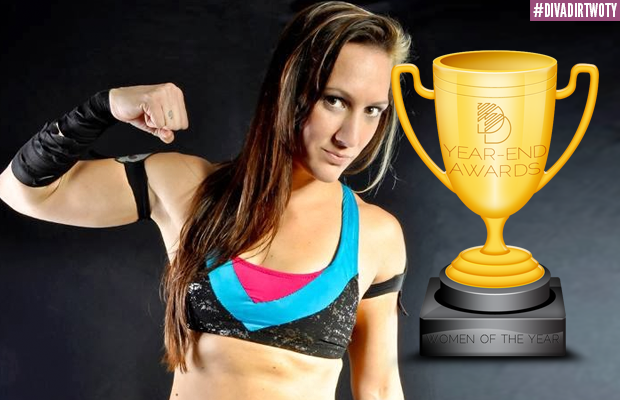 Slowly but surely, she once more climbed the SHIMMER ranks, leading to her resurgence in 2015. At this year’s spring SHIMMER weekend, Madison fell short in her first attempt at regaining the belt on volume 74, but only through a technicality. Originally, she got the pin and the win after hitting champion Nicole Matthews with the Hellbound, but the ruling was overturned when it was discovered that Nicole’s foot was on the ropes. Shortly after the match was restarted, Nicole hit the Vancouver Maneuver to retain the title, sneakily escaping with the belt like only she could. Eagles wouldn’t get her rematch until the volume 77 taping in October. This was brought on by a poetic bit of interference after Nicole’s title defense against Candice LeRae on volume 76, where Madison prevented Nicole from blasting Candice with the same fireball that won her the belt in the first place back in 2014. In volume 77’s No DQ match with the SHIMMER Title on the line, Madison and Nicole did battle using everything at their disposal. In the end, though, it was Madison who stood tall, capturing the title after hitting Nicole with the Hellbound on top of a steel chair. Madison would go on to finish her SHIMMER 2015 with a successful title defense against the upstart Nicole Savoy and a win in the epic Eight-Woman Tag Team match that marked the end of Portia Perez‘s in-ring career. It wasn’t all SHIMMER, all the time, though: Madison competed in two of SHINE’s greatest matches of the year at SHINE 26 and SHINE 30 with wins over La Rosa Negra and Su Yung, respectively. Back in her home country of Australia, Eagles continued to impress, wrestling Australia’s most promising female talent as well as a score of men. There’s no telling if Madison will match the mammoth length of her first reign (a whopping 539 days) on this go-round, but the mere fact that she’s back at the top of the mountain makes 2015 a year that she’ll look back on with great pride.